Have You Tried: Making Berry Jam? As our household creeps toward food self-sufficiency, you would think our decision to keep backyard chickens would incite more concern than canning fruits and vegetables. However, botulism is a big word and scenes from Louisa May Alcott books where women in full-length wool dresses sweat over a hot stove in the middle of August stirring the gelling fruit are writ large in my psyche. Last fall we canned tomato sauce for the second year in a row, and we did applesauce as well. I learned to bear the stove heat. So this weekend, inspired by the gorgeous fruit at the farmers market, I made blackberry jam – and I used raspberry honey for the sweetener. I learned several important lessons. #1 – I need a bigger stovetop or I need to make smaller batches. It was a precariously balanced stovetop with two water sterilizations going for the glass jars, the large black canning pot, and the pot for the cooking of the fruit. #2 – When the recipe says “Measured Ingredients: 4 cups mashed fruit” – read it twice. #3 – Don’t wear a white shirt while making blackberry jam. #4 – The whole house is infused with sweet warm berry goodness – absolutely divine. I followed the recipe included in the Pomona’s Universal Pectin, which I purchased from Downtown Home and Garden. Based on my experience with applesauce last fall – I thought I did not need pectin. But I was kindly corrected by Mark Hodesh, owner of Downtown Home and Garden, who shared that apple and quince are the only two fruits that have high enough pectin to gel – otherwise one must augment. According to Wikipedia, guavas, plums, gooseberries, and oranges can be added to the high pectin list. I am happy there are more weeks of berries because I would like to experiment further. I am curious to hear from those of you who have done this before – aside from not wearing a white shirt, are there more things I should watch for as I dabble? This is the recipe I followed (well, except for the fact that I put in enough lemon for 12 cups and only ended up with 9 cups of mashed fruit). It did gel and it tastes like blackberries. • Wash and rinse jars; let stand in hot water. Bring lids and rings to boil; turn down heat; let stand in hot water. • Measure mashed berries into pan with lemon or lime juice (4 cups of mashed berries for every ¼ cup of lemon or lime juice). • Add proper amount of calcium water (an addition that Pomona’s includes that helps to activate their pectin, 2 teaspoons). • Measure 1/3 cup honey and mix in 2 teaspoons of pectin. • Bring fruit to a boil. Add pectin-honey; stir vigorously 1-2 minutes while cooking to dissolve pectin. Return to boil and remove from heat. • Fill jars to ¼ inch of top. Boil 10 minutes. Check seals – lids should be sucked down. Lasts about 3 weeks once opened. 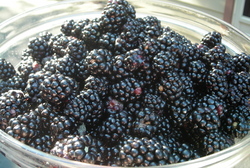 This entry was posted in In the Kitchen (recipes & more) and tagged Berry Jam, Berry Jam Recipe, Corinna Borden, jam, Jam Recipe, Pomona's Universal Pectin, Preserves, Real Time Farms. Bookmark the permalink. 2 Responses to Have You Tried: Making Berry Jam? You need to sterilize your jars for 10 minutes in boiling water (lid on the pot, so a high boil) to properly sterilize and kill any bacteria…in addition to the 10 minute hot water bath once the jars are filled. If you go to the website “soeasytopreserve” you can scroll around to find great food safety hints and facts or check with your local extension office. If you are planning to use a dishwasher to sterilize your jars, check with the extension office to see what settings. I boil all my jars on the stove. -All the canning literature I have ever read warns DO NOT boil the lids. The lids should be heated separately in a small pan of warm – not boiling – water. When you boil the lids you soften and begin to degrade the wax seal which can lead to seal failure when you actually go to do the canning. -There is debate on whether sterilizing the jars is really necessary. For what it’s worth, I don’t sterilize by boiling. I simply wash the jars by themselves in the dishwasher on a hot wash (some dishwashers even have a sterilize option), timing the wash cycle so that it ends when I am ready to start canning. Then I simply take the jars out of the dishwasher and fill them for canning. Much easier than boiling the jars and rings. Note that the rings themselves never touch the food in the jar so those definitely do not need to be sterilized. 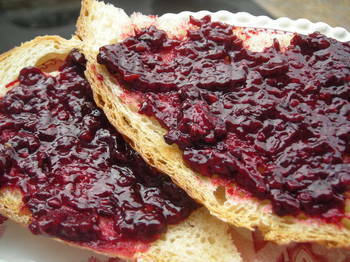 -You can make jam from fruits other than apples and quince without added pectin – although it is tricky. One way to do it is that under-ripe fruit has more pectin than ripe fruit – you can find recipes for pectin-free jam that specify the amount of unripe to ripe fruit that you need. Or you can add apples or quince or other high pectin fruits in small amounts to provide the needed pectin. Personally I usually just use the pectin. -Sometimes it takes up to 24 hours for the lids to seal properly. If your jar doesn’t seal immediately give it the full 24 hours before you either re-process it (can it again with a new lid) or put it in the fridge and eat it up. Happy jam making! Once you start it becomes rather addicting.